I suppose I should wade back into the renewed interest in fan speech at sporting events, given two recent events at college basketball games: 1) Last week, Marcus Smart, a star player for Oklahoma State, was suspended for three games for shoving an adult fan at a game against Texas Tech, in response to something that the fan, a prominent heckler at games, yelled at him (the fan, Jeff Orr, apologized for his role and voluntarily agreed not to attend any more games this season); 2) Last night, an adult fan was ejected from a game at the University of Memphis, apparently at the request of the referee. I do not know all the details, so I am not necessarily opining on either situation. But both have people thinking about fan speech, so I would weigh in with what I think are the general principles at work (And I know very well that I am not on the side of the angels in this). 1) At a game involving a public university (as both Texas Tech and Memphis are), the First Amendment is in play. Any efforts to punish fans for their speech is subject to First Amendment limits. This applies, I would argue, even in a privately owned arena that a government entity (such as a public university) is using for its official governmental functions. 2) The stands of a publcily owned/controlled basketball arena are a designated public forum for "cheering speech," which is a broad category consisting of just about everything will say (and shout) during a sporting event that is not inconsistent with that event. This includes taunts, insults, profanity, and even some racist and sexist comments against players, coaches, and refs, as well as all manner of social and political speech. 3) As a public forum, content-based regulations (as on a particular type of cheering) are subject to strict scrutiny, while content-neutral regulations (no signs) are subject to intermediate scrutiny. There also could be reasonable viewpoint-neutral restrictions on non-cheering speech, but the category of cheering speech is so broad, I don't know what that would reach. 4) Fans can be punished for the rare speech that crosses the line into fighting words, which has been narrowed to reach only up-close, targeted, face-to-face taunts. It is possible that Jeff Orr crossed that line, since the incident occurred in very close range--Smart had fallen out of bounds right below where Orr was sitting. And Smart says he heard Orr use a racial epithet, although Orr says he just called Smart a "piece of crap." I do not know if this was a close enough encounter to fall outside the First Amendment, regardless of what was said. 5) Labeling what Orr did "fighting words" does not justify what Smart did. Contrary to what some apparently have said on ESPN, one person using fighting words does not mean the listener has license to fight. It simply means that the speaker can be sanctioned. 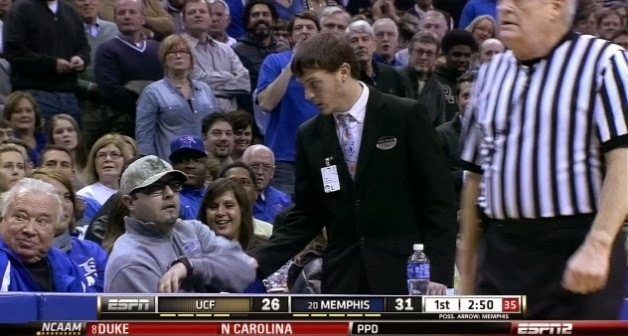 6) I legitimately cannot imagine what the fan at the Memphis game said last night that would have gotten him ejected and still be consistent with the First Amendment. Everyone at a basketball game is yelling and screaming and that is accepted as part of the game. So the ejection must have been based on the content of his particular screaming--a content-based enforcement that the First Amendment does not permit.